Developed by indie developer Watabou, Pixel Dungeon is an Old-School Roguelike, a genre of RPG game inspired by the original 1980s Dungeon-Crawler Rogue. While there have been many different incarnations of Rogue, and Roguelikes over the years, Pixel Dungeon stands out as an example of Old-School Cool meeting the needs of the casual gamer set. 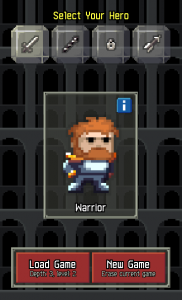 You begin Pixel Dungeon by selecting your hero. Are you a Warrior, Mage, or Rogue? Which legendary stereotype possesses the skill set that you require? Well, you’ll have to start playing to find that out. Once you begin, you are thrown into a completely random dungeon with the goal being to build your skills and crawl your way down each level to the final boss. Gameplay is turn-based and you simply tap on the screen where you want to move, attack, or investigate. On your way you will find items, enemies, traps and more, with each level you descend delivering harder and more powerful enemies. 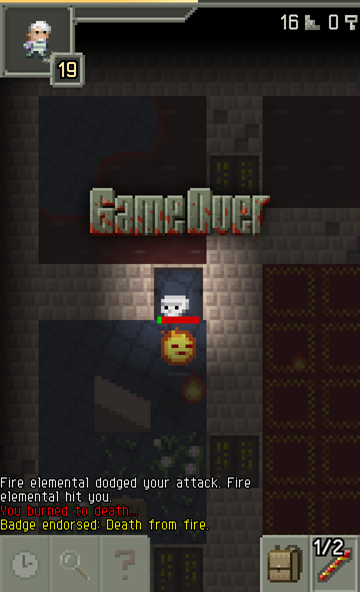 It’ll be easy to make it down a few levels, but very, very hard to survive. 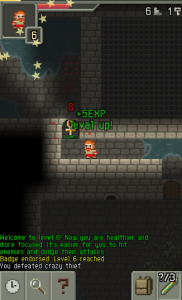 Despite being based on Brian Walker’s PC and Mac Roguelike, Brogue, Pixel Dungeon shakes off the traditional text-based graphics of Rogue in favour of shiny 8-Bit visuals. The cartoon-like graphics are reminiscent of old Super Nintendo games and the simple, top-down view helps make the most of the colourful sprites. A roaring MIDI-styled backing track is provided by independent musician Cube_Codeand it sounds just like a Sega Mega Drive rendition of the Conan the Barbarian soundtrack. Currently Pixel Dungeon is free on the Google Play store, which already makes it a game worth trying. 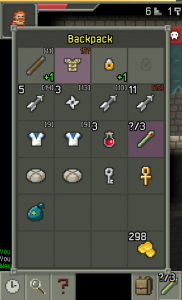 Every play-through of Pixel Dungeon is completely random, with new maps generated from scratch, each with new enemies and items. You can save one game at a time, but starting a new adventure will erase any you had previously saved. This was the frustration and challenge that drew most people to the original Rogue, and it still plays exceptionally well today. For casual mobile gamers, this style of gameplay provides instant and addictive gratification that you can comfortably put in your pocket and pick up later. 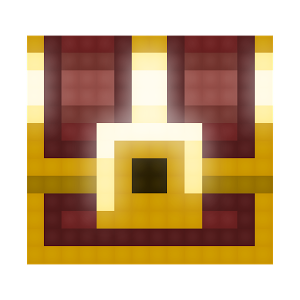 With an extensive andOh So Helpful Wiki Page, you’ll find that there is so much more to Pixel Dungeon than that first, painful, play-through, and the helpful community and developer are constantly striving to make Pixel Dungeon bigger, and better. Pixel Dungeon is available on the Google Play Store right now, for free.